As of last night, The Hunger Games: Mockingjay—Part 1 is taking over movie theaters worldwide. The film earned $17 million dollars on its debut evening, which is down from the last chapter, Catching Fire, but still the biggest first night of the year so far. (To put it in perspective, the previous best for 2014, Guardians of the Galaxy, took in $11.2 million its first night.) There is one place where the film isn’t taking over, however, Thailand, as some movie theaters are refusing to show it. A while back, we wrote about how Thai protesters had adopted the three-fingered salute from The Hunger Games as a form of resistance against government oppression. And that still appears to be going on. According to The Hollywood Reporter, five students were arrested Wednesday for flashing that sign at Prime Minister Prayuth Chan-Ocha, and in the wake of that, just hours afterwards in fact, Apex Group, a local theater chain, pulled the release. If it sounds like I didn’t enjoy Mockingjay, that’s not true, it’s an entertaining enough way to spend a couple of hours, and there is enough going on to keep you occupied. This simply feels more like a chapter than a complete work. Again, that’s because it is, but it also skips over a number of elements in short order, and cuts off just when you’re most engaged and invested. 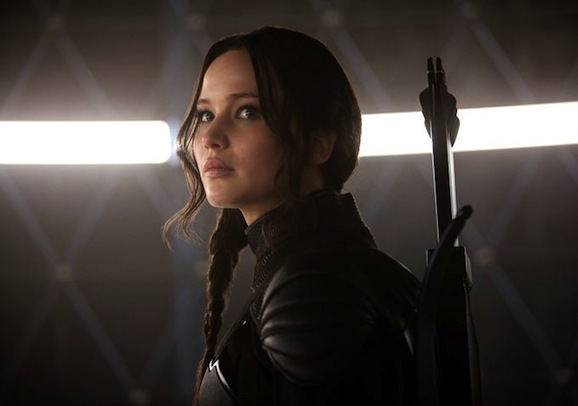 Did you know The Hunger Games: Mockingjay—Part 1 is about to open? The movies are rather popular, so you’ve probably at least heard of them, right? Promos for the first part of the series finale are everywhere, and will probably make up the bulk of the advertising you see on TV for the next week, until the film opens on Friday. In that spirit, here are two more TV spots to gawk at, as well as a new illustrated poster. As excited as I am to see Mockingjay, which is a great deal, I’m even more excited for the film to open just so there won’t be this glut of marketing assaulting my eyes at every turn. We all know it’s going to be massive and Lionsgate is pushing it as hard as they possibly can, but it’s getting old. We get it already, this is a big deal. Now that Interstellar is out of the way, next up on the blockbuster sci-fi movie docket is The Hunger Games: Mockingjay—Part 1, the beginning of the end for the lucrative teen dystopia franchise. Even if you wanted to ignore this film, you’d have to go to some extreme lengths, because the marketing is everywhere, all over your computer and your TV and it won’t surprise us if they commence with the skywriting campaign before too long. And her are two more pieces of that promotional puzzle, a new TV spot and a clip along with an interview with some key members of the cast. New is a bit of a misnomer for this TV ad. There is some fresh footage, but overall it’s damn near indistinguishable from the many you’ve already seen come down the pipe. You get a quick look at Katniss Everdeen’s (Jennifer Lawrence) new digs in District 13, some quick moments of high action, and a reminder that the nefarious President Snow (Donald Sutherland) plans to make the heroine suffer by tormenting everyone and everything she holds dear. That’s pretty much par for the course as far at The Hunger Games goes. Another day, another piece of promotion for The Hunger Games: Mockingjay—Part 1. Over the weekend we saw a clip introducing some of the new faces, but this new TV spot returns the focus to heroine Katniss Everdeen (Jennifer Lawrence) with an emphasis on how hard it can be to be her friend. It’s easy to be brave and strong and stand up for what’s right when it’s just you who has to pay the price, but when your friends and family, the people you care about, get caught in the crossfire, things get a little more dicey. That’s the main point of this video, and is one of the key strategies that President Snow (Donald Sutherlan), despotic leader of Panem, plans to use against Katniss. He’s going to tear down everything she holds dear in this world and try to push her to her breaking point.